Michael Jackson's sister Janet Jackson arrives to court for the trial of Conrad Murray. 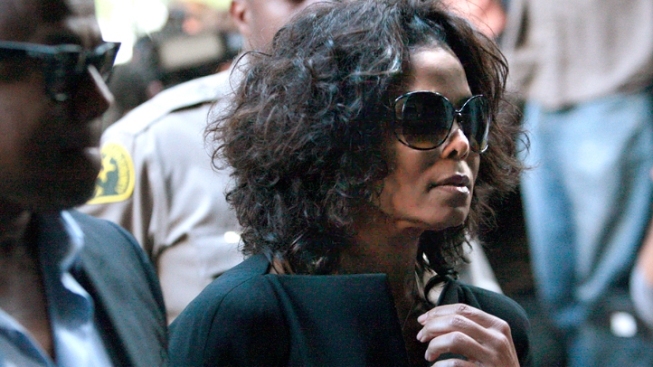 Janet Jackson will return from Australia to Los Angeles for the trial of Dr. Conrad Murray, the man charged with involuntary manslaughter in the death of her brother. Jackson announced Sunday that she will reschedule a series of concerts in Melbourne to be with her family as attorneys for Michael Jackson's personal physician present their case. "I want to thank my fans in Australia for their love, support and understanding," Janet Jackson said in a statement. "When I planned these shows, the schedule in California was completely different. After talking with my family last night, I decided we must be together right now. I'm looking forward to being with you for the Gold Coast, Sydney, and the Melbourne concerts. You are all so important to me. This saddens me in so many ways. I love you,"
The announcement came as defense attorneys prepare to present their witnesses this week. A final prosecution witness will face more questions Monday, the trial's 16th day, before defense attorneys call their witnesses to the stand. "It is important that Janet is with her family at this critical point in the hearing," said promoter Paul Dainty. The defense might wrap up its case later this week. Three Jackson concerts were scheduled for this week in Melbourne as part of her "Number Ones" tour. Instead, Jackson will perform at a one-night only event Nov. 3.